Calling all yarn lovers! Grab your needles (or hooks) and join us for an evening in the tasting room with friends who knit, sew or crochet. This is an open group to all crafty wine lovers. There is no formal instruction, but several of our long-time stitchers are happy to help beginners! Sip some wine, exchange patterns and make a few friends along the way. Join us on the first and third Wednesday of each month for an evening of sipping and stitching. $75 ($100 VIP) tickets include drinks, heavy appetizers, live music from Tastes Like Chicken, and more! Find more information and purchase your tickets HERE. Find inner peace, strength, clarity (and an adult beverage!) with a yoga session at The Sycamore at Mallow Run! Join us at 6:30pm on Tuesday, May 7th for a relaxing and empowering series of yoga poses and meditation. 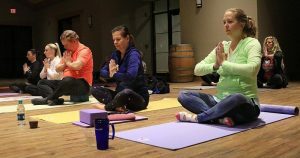 Registration is $12 and includes a full yoga class led by a professional instructor, and a glass of wine or beer of your choice! 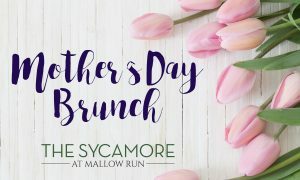 Treat Mom to a delicious and relaxing brunch at The Sycamore at Mallow Run! CLICK HERE for more information and to reserve your seats. Join us at 6:30pm on Tuesday, May 21st for a relaxing and empowering series of yoga poses and meditation. 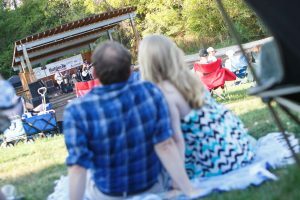 KICK-OFF TO THE 2019 PICNIC CONCERT SERIES! The complete 2019 Picnic Concert Series schedule will be announced here on April 1, 2019. Stay tuned for updates! Want to stay up to date on our wines and events?